Elderberry bushes (Sambucus spp.) are low-maintenance, medium-sized to tall shrubs that produce berry-like edible fruits. 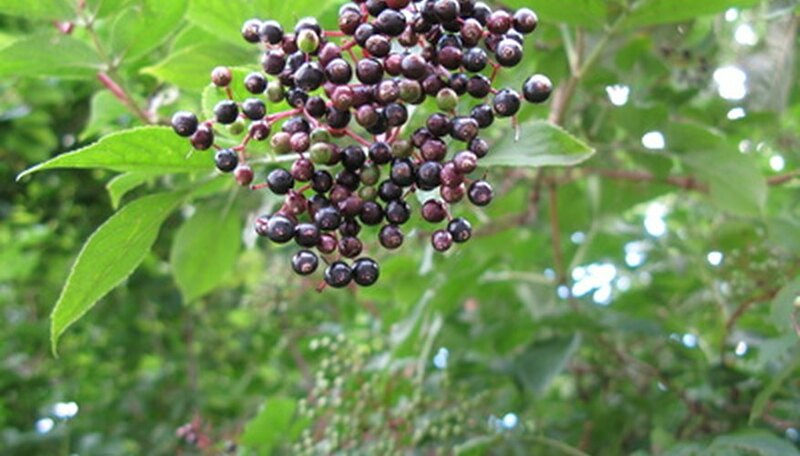 The purplish-black, clustered elderberry fruits are often used in making wine, jam, jelly and pies. Most elderberry bush varieties are hardy down to USDA Hardiness Zone 3 or 4, tolerating winter temperatures as low as -35 degrees F. Elderberry shrubs bloom during late June in flat-topped clusters of creamy-white flowers. The most common elderberry species is the American elderberry (S. canadensis). Water your elderberry bushes deeply and thoroughly to soak the entire root area once or twice each week to supplement rainfall during the first growing season. After the elderberry bushes are established, water deeply once per week in the absence of rainfall. Weed around the elderberry bushes by hand during the first year or two after planting them. Spread a 2- to 3-inch-thick layer of organic mulch on the ground around the elderberries to suppress weeds. Weeding won’t be necessary after the elderberry bushes grow larger. Feed your elderberry bushes once each year in early spring with a 10-10-10 NPK fertilizer at a rate of ½ pound for each year of the elderberry’s age. For mature plants, apply no more than 1 pound of 10-10-10 NPK fertilizer. Prune your elderberries when the bushes are dormant in late winter or early spring. Remove all weak, dead and damaged canes, as well as any canes that are three years old or older. Harvest the elderberry fruits by picking off the entire fruit cluster. The elderberries should ripen and be ready for harvest in late August through mid-September, depending on the variety. Prune away any diseased or infested canes from your elderberry bushes frequently to treat powdery mildew and cane borer infestations. You may also apply an appropriate fungicide or insecticide to treat these problems in severe cases. Don't hoe weeds from around the elderberry bushes, as they have extremely shallow and easily damaged root systems.